Charlotte Bronte’s ‘Jane Eyre’ is a title that has received iconic status and following on from a critically acclaimed season at the National Theatre. This adaption devised by the Company; a collaboration between the National Theatre and Bristol Old Vic, presents the much loved classic re-imagined for the stage. Recently, I was invited along to attend the press day for the 2017 Tour as part of the Theatre Royal Plymouth’s Bloggers scheme. An opportunity I was unbelievably excited to take part in. Having heard so much about the production I couldn’t wait to learn more. Arriving at Copperfield Rehearsal studios, we were welcomed by producer Kash Bennett who kindly introduced us to the production. Everyone was looking forward to the day’s events which included a talk from the director Sally Cookson, extracts from rehearsals and the opportunity to interview members of the creative team and cast. Coming to the Theatre Royal Plymouth on the 1st – 6th May, the 2017 tour highlights the life story rather than the love story of Jane. “One woman’s fight for freedom and fulfilment on her own terms”, ‘Jane Eyre’ is a story about equal opportunity and how we respond to it. Director Sally Cookson explained that Jane (Nadia Clifford) understands an individual’s rights and challenges anyone or anything that threatens her integrity. Strong-willed Jane is a modern heroine which is something Cookson believes has given the novel its enduring power. Speaking about the devising process, Sally, an associate Artist at Bristol Old Vic, explained that although challenging it’s been incredibly exciting taking this classic tale from the book to the stage, “The first thing I do is take everything from the book that excites me”. Telling us a little more about what first sparked the idea for the production she continued, stating that having been a personal favourite she simply knew that ‘Jane Eyre’ had to be her next project. Endlessly energetic, the production’s narrative focuses on the visual aspects of the performance which made it even more fascinating to hear about the creative process as a whole. Movement director Dan Canham explained that devising the production is very collaborative. Comprised of seven actors and three musicians, the cast assume multiple roles with the exception of Nadia Clifford who stars in the productions title role of Jane. There are no predefined steps or choreography every action a character takes is in response to another and although physically demanding the cast all agree that it’s truly rewarding to see results. Director Sally described Jane as a Character who is always taking action and the physicality of the production see’s the cast do the same. 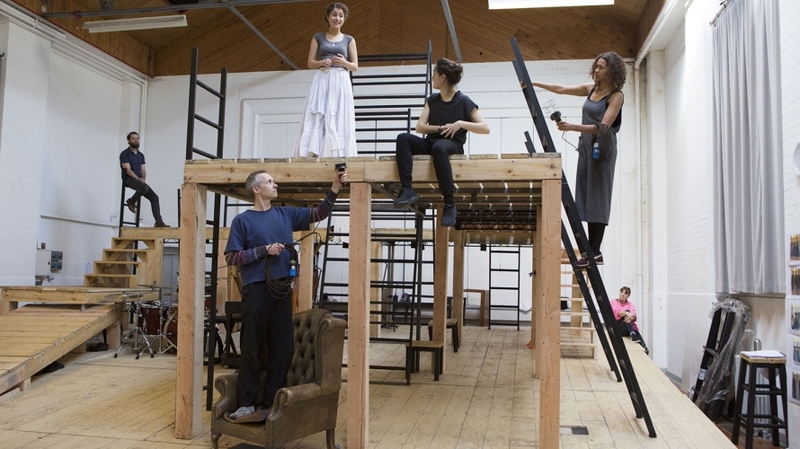 Similar to an obstacle course, the set represents the struggles Bronte’s Characters are forced to endure, this way the audience are able to see the hardships the characters overcome through the staging itself. Fashioned out of wood and metal framework, the set designed by Michael Vale is both imaginative and simplistic. There is only one set throughout the entirety of the performance and simple costume. Minimalistic, Sally stated that the visual aspects of the production subtly reference the era without limiting the story. Having previously been performed as a two-part production throughout 2014-2015, this collaboration see’s the 2017 adaption performed in one sitting. Music is a central component to the production with the Musicians; Matthew Churcher, Alex Heane and David Ridley, remaining present on stage. With the production being centered on both movement and sound, Sally explained that the creative team including musician Benji Bower had been inspired by the fabulous music in the 1943 version by Bernard Herrmann. Something that had been incredibly important throughout the devising process was giving the character of Bertha Mason a voice, which is beautifully captured through Melanie Marshall’s solo. Rochester’s wife, Bertha remains a secret but for this depiction Sally wanted to tell a little more of her story. Incorporating Gnarls Barkley’s ‘Crazy’ into the production was truly incredible as it was completely unexpected and breathtakingly moving, becoming a definite highlight from the day. Only two and a half weeks into rehearsal, we were able to watch extracts of the show which left me in awe. Learning a little more about the creative process, the intentions behind the production and listening to the cast’s experiences was truly unique. I thoroughly enjoyed the day from beginning to end and I am so grateful to the theatre for inviting me to take part. A compelling production filled with spirited and determined characters I didn’t want to miss a single moment. Inventive, this adaption is truly captivating and one I can’t wait to see.